25 years of our American semester! This year marks the 25th year of the American semester – an annual exchange program between Charles University's Faculty of Science and one of the most prestigious American universities, Dartmouth College (New Hampshire, USA). Roughly halfway through the program, on May 3rd – 4th, we celebrated the 25th anniversary of the program with a number of events for faculty and the general public. 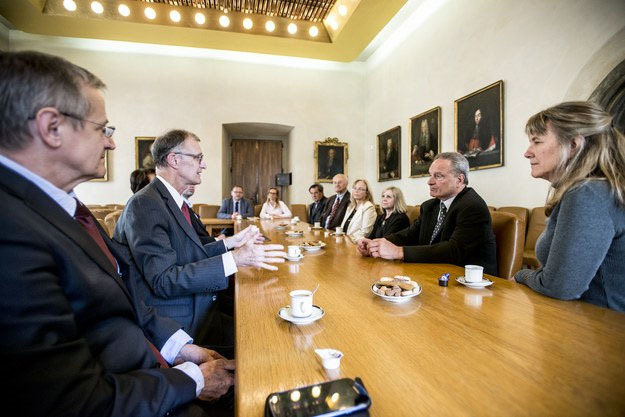 The university exchange program, which each year brings a group of American students to Prague in March, was founded in 1994 largely through the efforts of Prof. George Demko and his Czech colleagues, Assoc. Prof. Ivan Bičík, Prof. Dušan Drbohlav and Dr. Ludvík Kopačka. The primary aim of the program is to provide American students a comprehensive overview of Czech geography in the context of European development, with a special focus on the countries of Central and Eastern Europe. 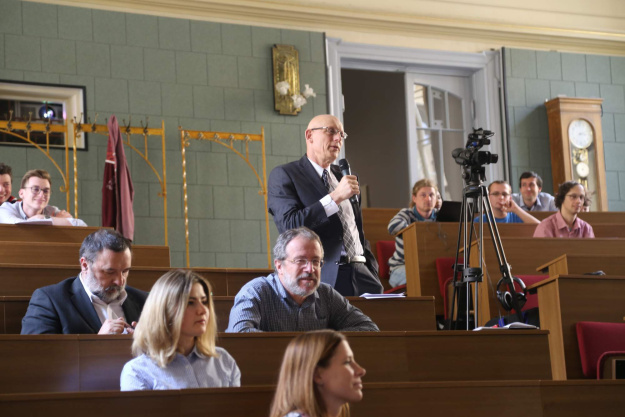 Several comprehensive lecture blocks supplemented with numerous thematically-related excursions gradually familiarize students with all essential aspects of the spatial and social development of the Czech Republic, especially over recent decades. Students thus obtain a basic overview of Czech geography. After taking the survey examinations at the end of the first month of the program, in late April students start to work on their own individual or group projects. In addition to study activities, program participants also have plenty of time to learn about Czech and Central European culture and to establish professional and social contacts with Czech students. The entire program always runs from the end of March to the end of May. The international exchange program with a prestigious American university is also quite beneficial for the Czech side, which is enriched by new professional and social experiences, not just for the lecturers, but also for the undergraduate, master’s and post-graduate students in the Geography Department of Charles University's Faculty of Science who are involved in organizing the program. By spending time together on trips and in other parts of the program and during informal sports and cultural activities, students have the opportunity to establish contacts with their American counterparts while improving their English. "You must love the things that you do. And in my opinion, this is one of the main factors where our American semester has been successful. Despite being a highly “institutionalized and formal” event, many of us look forward to it very much, since we have become very good friends with our American partners/professors. And if you are friends with the “parents”, then you also like their children – in this case, our American students,” says Professor Dušan Drbohlav from the Department of Social Geography and Regional Development. During this year’s 25th American semester, the Geography Department of the CU Faculty of Science is hosting a group of 10 American students who are accompanied by Dr. Coleen Fox in the first half of the program and by Prof. Mona Domosh in the second half. This year’s “silver” American semester officially commenced on Wed. March 28th, 2018 and will run until June 2nd, 2018. 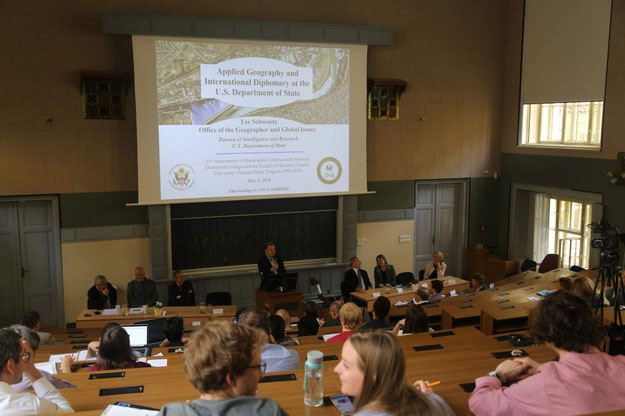 “This year’s celebrations included extremely well-received lectures by top American geographers, Dr. Lee Schwartz and Prof. Marie Price, which were given on May 3rd at the Faculty of Science at Albertov 6”, adds Assoc. Prof. Eva Janská, a co-organizer of the American semester. For the current program of lectures by American guest speakers click HERE.